Propane isn’t just for barbecues and space heaters. It can power everything from tankless water heaters to indoor and outdoor hearths, generators and more. But versatility is just one of propane’s many benefits (see below for more) – in fact, it may be the best-kept secret in the home energy industry. Efficient – Propane appliances typically reduce energy costs, delivering better value and comfort than other energy sources. Safe – The National Fire Protection Association (NFPA) enforces strict rules about propane handling, so few accidents occur each year. Propane is also nontoxic and nonpoisonous, so tanks can be safely installed underground. Green – Propane emits far less greenhouse gas than most other energy sources. Powerful – Propane can fuel any system in your home while using less energy and keeping you more comfortable than electric or heating oil-based systems. Reliable – Millions of people worldwide use propane to power their home. Made in the U.S.A. – Almost all the propane used in the U.S. is produced domestically, which means every gallon you buy contributes to America’s energy independence. 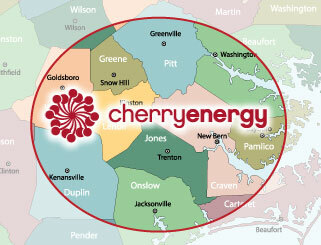 Contact Cherry Energy today to learn more about making the switch to propane – or to get started with your propane installation or project!